Around a 50% of the consumers will be Millennials on 2017. That means, business and brands should focus their strategies on these consumers understanding how its behaviour is. Thus, The most important thing is to know their tastes, how they consume and the trends they are following. This generation is characterized by follow all the trends on the Internet and generate content. New occupations, such as youtuber and blogger, have emerged as a result of the Internet revolution. Influencers are followed for a lot of people and brands have realized of this. Companies are launching campaigns through the influencers channels. 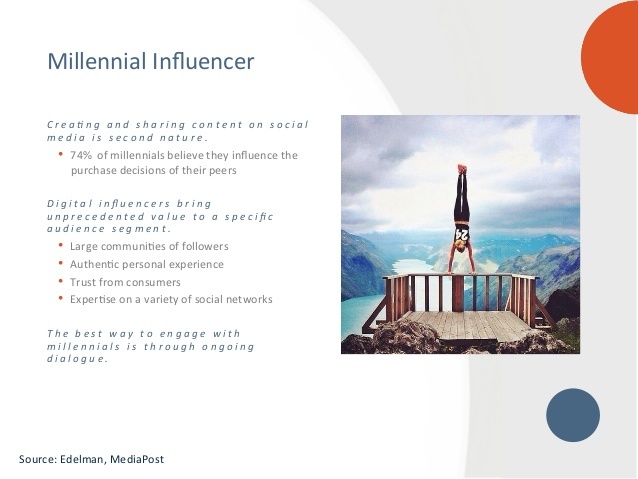 Is it efective include influencers into your marketing strategy? The answer is yes. Your storytelling is going to be more credible if an influencer tells it, in fact, they are able to have friendly conversations with their followers. A combination of content marketing and influencers is a great solution to generate engagement with your target. What should you have to take into account when you chose an influencer? This person have to share with your brand its values and its followers have to be the same as your target. It is very important the way the influencer has to comunicate everything and the branded content you decide to do because it has to be memorable. Here we have a man who explains his own experience about a young Millennial girl who talked to in an aeroplane. She was working in a company which it seemed she wasn't quite motivated about what she had to do. Millennials are coming with strength to fight for what they want, but to reach the success first they have to do different things. But he thinks that talking about the behavior of young people without talking about the challenges they face is dumb. Millennials: What ‘Old’ looks like? Here we have an experiment which consists of asking the Millennials What age they consider to be old. So they were asked to show how what "old" looks like. What platforms and social networks are used more by the Millennials ? Millennials are not able to live without their smartphones, in fact, an investigation by Carat reveals Millennials is the generation which access more to the Internet through their smartphone and this means, an 85% of this group of people. Moreover, once they are connected, they use the Internet to check their profiles of their social networks. This is well-known by the companies, for this reason, a majority of them launch marketing campaigns focus on mobile. This generation consume a lot of videos and they love to create content, they even become influencers on the Internet through the social networks, collaborating with powerfull brands. 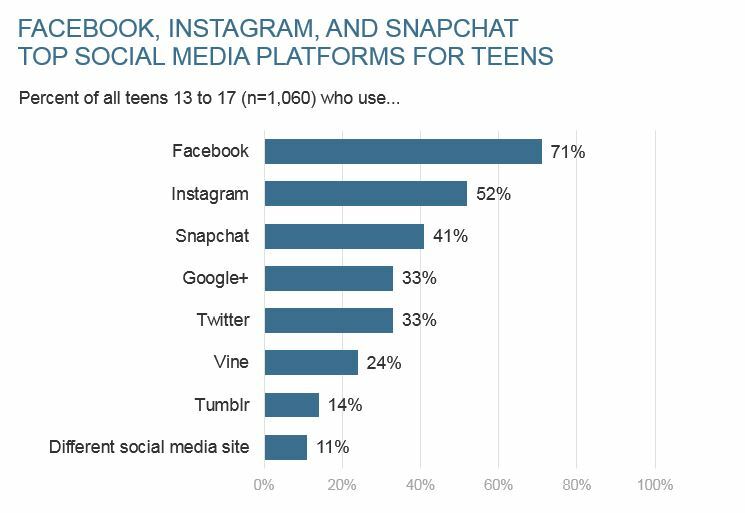 But the main question is the next one; What platforms and social networks are used more by the Millennials ? Well, the most popular is Facebook following by Instagram and Snapchat. A 71% of Millennials use more than one social network and they use it daily. As a company, they should know what Apps are the most successful ones and understand why these Apps are trendy. The Gen Y are always on those they can share content easily and of free payment. Its very important the way they share the content, it is in a social way because we live in a society based on "likes"
Most people think that Millennials are not going to do a better work than the previous generation. The truth is that they are growing every day more and more, and it's said that most companies are not prepared for this, Millennials are coming with an enormous empower. The large and upcoming of Millennials Generation don't think as their parents or grandparents. Their different point of view and the way of doing things, specially business are influencing everywhere. The next Generation of Leaders are coming with so much power but people do not realize about that fact. They are bringing new issues and new challenges and opportunities to the marketplace. Kelly is the author of the bestselling "Adulting: How to Become A Grown-Up in 468 Easy Steps" which has been featured in the New York Times, Wall Street Journal, and on the Today Show, among others. In this speech Kelly talks about the great change that Millennials have resulted in society and how much we should listen. At first all they seem not contribute anything useful but then we will realize that they are strictly necessary for our development. This is a real presentation of an authentic Millennial, Keevin O'Rourke. He is strategizing ways to grow his startup company, Monday Creations. He is a passionate entrepreneurship, in fact, he is the vice president of his campus Entrepreneurship Club and an advisory board member for a local One Million Cups group. Keevin is the reflection of what truly a Millennial is. Millennials want to know why they should work for you, rather for themselves, because they are starting new startups dreams of their own. Here we have a clear representation of what Millennials believe about work.